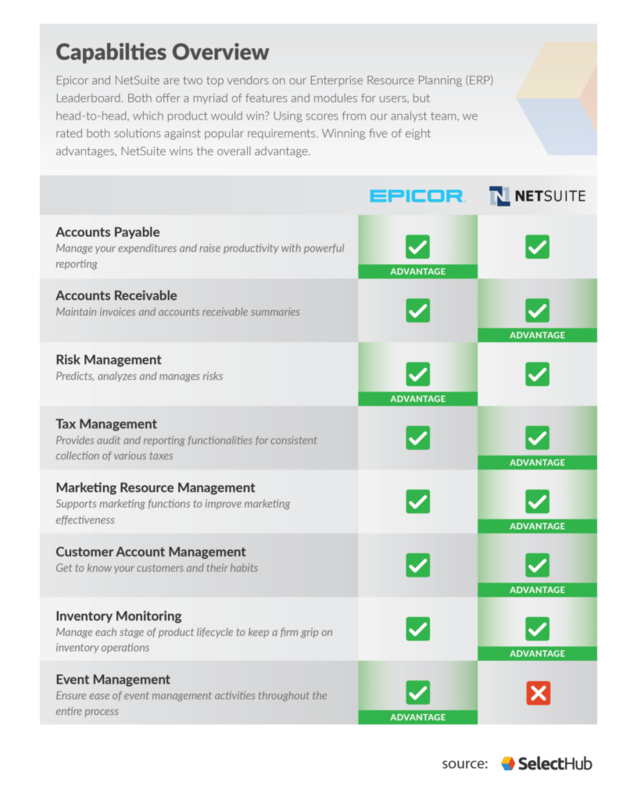 Epicor vs NetSuite: Which ERP Software Is Right For You? Get our ERP Software Comparison Matrix. NetSuite can integrate basic accounting functions with compliance management and improve overall business performance and efficiency. While this vendor doesn’t receive the advantage here, it’s definitely not weak by anyone’s standards. But Epicor goes a little bit beyond your basic business-bolstering capabilities. With Epicor’s ERP, a user can enter supplier invoices for purchases made by your business. Then, he or she can create checks right there for payment. You can generate a payment for a specific invoice, all invoices that are due or just those for a specific supplier. NetSuite has slightly better tools when it comes to this functionality. Its accounting module is exhaustive and manages all accounts receivable activities. Epicor is still rated well, though, and contains an inclusive list of tools to manage invoices, credit and cash management. When shopping for an ERP, you’ll want a software that not only predicts risks but also analyzes and manages current crises. NetSuite’s applications are user-friendly and conveniently display your risk management tasks from an individual dashboard. It’s not bad, but for more robust features you’ll want to integrate a third-party risk management solution. Most importantly, NetSuite is only available through cloud deployment. If this isn’t possible for your company for compliance reasons, then this vendor definitely can’t offer you the risk management you’re looking for. Epicor’s capabilities here are a bit stronger, giving them the advantage. 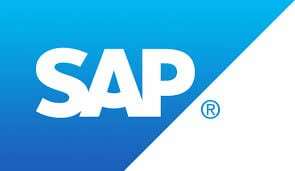 Firstly, this ERP is available on the cloud and as an on-premise solution. Epicor’s Governance, Risk and Compliance (GRC) suite employs strategies to reduce risk and maintain regulatory compliance. These two tasks help keep your business competitive in a market dictated by supply chain mandates and other regulations. While tax management isn’t an extraordinarily exciting ERP function, it’s a necessary one nonetheless. But don’t worry, we’ll make this one quick and painless for you. NetSuite wins out on this one. NetSuite’s solution can manage tax requirements while heeding numerous government standards and regulations with ease. Your tax filing is pre-built with this system, and it offers reporting capabilities that are specific to your country. Even so, Epicor still offers good tax management capabilities. Epicor’s Tax Connect automates sales tax return generation, freeing up valuable staff for more critical tasks. Tax Connect can manage tax jurisdictions, tax code rates and tax rules for particular commodities. NetSuite has a large advantage over Epicor when it comes to marketing. NetSuite allows your company to run multiple campaigns across your various subsidiaries all while measuring their success. This gives you a better understanding of your campaigns and allows you to make more strategic decisions in the future. This solution also includes their Services Resource Planning module which lets you see the entire services lifecycle. Seeing opportunities for growth as an ongoing process rather than separate events makes it easier to obtain repeat business from existing customers. Integrate this ERP with NetSuite CRM+ for even deeper marketing analytics and ventures. Epicor’s tools are more slimmed down, but still allow businesses to seek out opportunities in the market for growth. If you skimmed the section above on MRM, it should be no surprise to you that NetSuite wins in Customer Account Management as well. NetSuite’s CRM centralizes all customer data, even allowing access from an invoice, so getting information is easy when users need it the most. Epicor gets only an “adequate” rating on this one. But while Epicor may not offer the same vigor in its tools, you’re rewarded with a lower monthly subscription rate when you have fewer than 14 users. And if you have fewer users, you may find some of NetSuite’s more complex features are bulky anyway. While our scores are a very good indicator of how a system will fulfill your requirements, every business is different and it’s possible that you need less and not more. Epicor offers a number of inventory management tools like demand forecasting and lot billing. It also offers lot traceability, which helps you trace products’ origins and serialize accordingly. Lot traceability is particularly essential to the food and beverage industry, which regularly deals with expiration dates and recalls. However, NetSuite wins this round. Features like multi-location planning and inventory visibility ensure your stock levels are always where they should be. NetSuite also offers stronger lot traceability and tracking within warehouses. Live events are growing in popularity and as such, many businesses require a more organized and reliable way to manage them. Epicor has pretty good event management capabilities, allowing users to oversee event activities using campaign feedback and analysis. NetSuite, on the other hand, has no event management features or support. When comparing NetSuite vs Epicor, it can be hard at first to see the differences between the two systems. Both vendors offer nearly all the same features, with event management being the only exception (and not offered by NetSuite). Considering this, you have to go deeper and take a look at the actual functionality offered by each tool. According to our analyst team’s reports, NetSuite wins the advantage for five out of eight features, making it the more in-depth and robust system overall. However, Epicor did have better tools for several features. If these features are what’s most important to your business, you may find Epicor ultimately more useful. Which ERP system do you plan on implementing? Did our comparison change your mind in any way? We’d love to hear your thoughts and opinions in the comments below!